What does the SPO consider to be a “GSFC collaborative need”? GSFC researchers have various needs that can be met using existing NASA vehicles that include procurement, SBIR/STTR, and internal R&D. Other needs, however, fall outside the bounds of existing programs that can “potentially” be met instead through creative collaborative partnerships facilitated by the SPO. For example, assume a NASA researcher has insufficient funding/equipment/materials/skills to meet an R&D challenge beyond existing programs. An industry/university/government partner could supply part or all of the needed funding/equipment/materials/skills to NASA in exchange for an option to license any resultant inventions if interested. Similarly, the challenge may be to find an industry partner to commercialize NASA’s successful R&D and then supply a product or service back to NASA to meet mission needs. While many unique scenarios exist, in all cases GSFC would benefit from a collaboration with an outside third party. 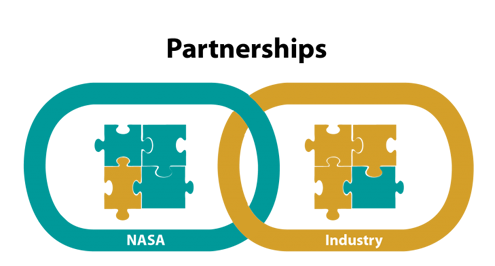 In suitable situations, the SPO can help NASA researchers to seek out such partners, vet candidates, and establish win-win agreements to make the collaboration a reality. Who can submit a collaborative need? Any NASA civil servant can discuss a potential collaborative need to the SPO for consideration. When should a GSFC researcher submit a collaborative need, to whom, and how? A NASA researcher with an idea for pursuing an outside collaboration should contact one of the Technology Managers within the SPO. Such projects are conducted on a case-by-case basis when there is a belief that identifying such a third party has a promising chance of success. Why should a GSFC research submit a collaborative need? Like all organizations and government agencies, researchers at GSFC are increasingly resource constrained. Exploring collaborative partnerships is a unique (and often less considered) way to enhance progress on projects that might otherwise languish or accelerate projects already well funded. What happens after discussing a potential collaborative need with the SPO? The SPO engages its network to seek out and vet potential partners, engaging researchers to aid in the vetting process as it proceeds. The appropriate partnership agreement (e.g., Space Act Agreement) is established to allow GSFC researchers and the partner to officially collaborate for mutual benefit.